Fuerst Ittleman David & Joseph, PL brings together attorneys practicing in the fields of regulatory compliance (FDA, Customs, USDA, EPA and international trade law), tax and tax litigation, anti-money laundering business compliance and litigation, corporate commercial transactions and complex civil and white collar litigation related to these areas. The firm is located in Miami and represents both domestic and foreign clients before the governmental and international agencies that regulate and influence international commerce and in the Federal and State courts that adjudicate these matters. The firm is dedicated to providing its clients with the highest quality professional service as efficiently and effectively as possible. We are recognized for delivering timely, practical, cost-effective advice and counsel. We are committed to establishing responsive, proactive relationships with our clients and remain dedicated to providing the close, personal attention necessary to ensure long-lasting relationships. Andrew S. Ittleman is a Founder and Partner of Fuerst Ittleman David & Joseph, PL. He concentrates his practice in the areas of White Collar Criminal Defense, Anti-Money Laundering compliance, and Food and Drug Law. Mr. Ittleman litigates extensively against the United States government in civil and criminal matters. Mr. Ittleman’s practice is primarily devoted to the representation of regulated entities in complex disputes with the United States government. 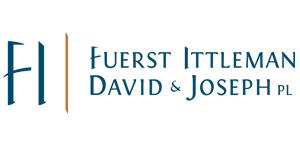 Virtually all of Fuerst Ittleman David & Joseph, PL’s clients are regulated by the federal government in some way, and Mr. Ittleman focuses his work on those clients which have entered into a dispute with the government regarding whether, and if so how, certain laws or regulations should apply.